Smiles, good vibes and festive costumes encouraged! PVC, light wood, aluminum poles must be no thicker than 1” in diameter. Don’t risk losing track of your friends or missing the perfect photo op! Keep your phone powered up at our battery charging station. Check your festival map for locations. Stay hydrated! 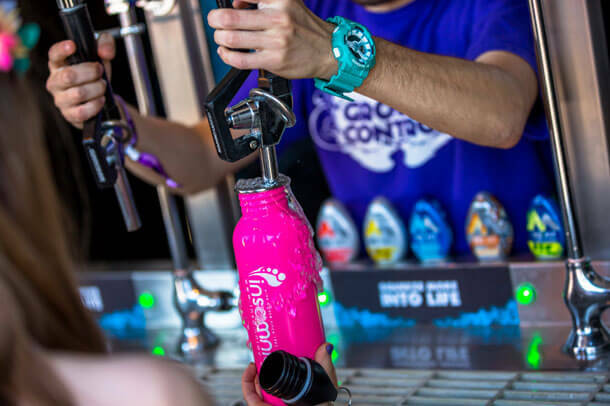 Fill up your Insomniac bottle (get your very own at our merch booth), CamelBak or any empty beverage container (purchased inside the festival) at our free hydration stations. Look for the water droplet symbol on a festival map to find the nearest station. Insomniac merch booths can be found on the event map and will have a variety of T-shirts, jackets, backpacks, sweatshirts, official water bottles and more fun stuff! We get new styles and designs each year, so don’t miss out. ATMs will be located around the venue. Locations will be marked on the festival map, which will be available at the venue, online before the weekend, and on the Insomniac mobile app. The Insomniac General Store is stocked with items you may have forgotten at home. From flip-flops to eye drops and ring pops — these are just a few of our favorite things from our shops. Info booths will be stationed throughout the venue. Check your festival map for specific locations. Lost & Found booths will be available at the venue. Check your festival map for specific locations. Following the event, lost items will be held at the Insomniac Office in Los Angeles. If you need to retrieve your item after the festival is over, email us. Please allow 72 hours for a response. Insomniac welcomes all, and we strive to make our environment accessible to our guests with disabilities. During the festival, the venue will feature accessible parking, restrooms and other amenities, as well as designated areas for wheelchair users and their companions. Accessible parking will be provided near the festival entrance for those displaying valid ADA license plates or hang tags. These parking areas will be closely monitored to ensure that ADA parking is made available only to those who need it. An accessible entrance is located near the ADA parking. Once inside, look for the Access Center (noted on the festival map), which is staffed by personnel who can answer any accessibility questions, as well as provide your wristband for all accessible viewing platforms. 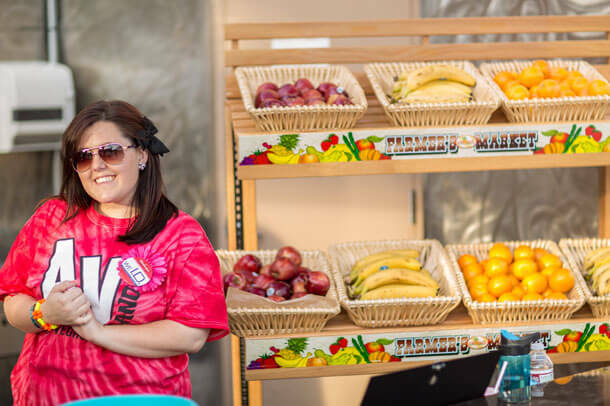 Located inside the venue near the accessible entrance, the Access Center is staffed by personnel who can answer any accessibility questions, as well as provide your wristband for all accessible viewing platforms. This is also a designated location for wheelchair battery recharging. All public restroom areas, ATMs and concession stands are accessible to our patrons with disabilities. Please see your festival map for locations, or contact the nearest staff member for assistance. 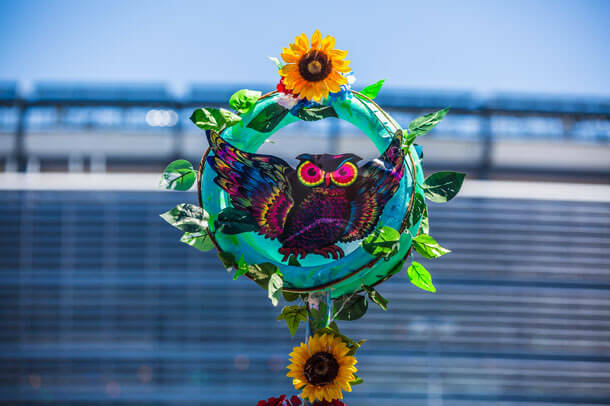 EDC New York takes place at Citi Field and in several surrounding parking lots. Most areas are relatively flat. 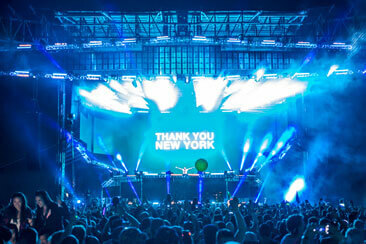 EDC New York provides an accessible viewing area for each stage. To gain access, please check in and pick up your wristband at the Access Center. Service animals are the only animals allowed onto the festival grounds. First aid locations are offered throughout the venue. Please refer to your festival map, or contact the nearest staff member. Festival event staff have been trained in proper emergency preparedness. If you have any questions, suggestions or comments about accessibility at this or other Insomniac events, please contact us at access@insomniac.com. We are committed to continually improving the festival experience for our Headliners with disabilities. Q: What time does the event start & end each day? A: As long as you are holding a ticket that has not yet been scanned that day, you may enter any time during the event. Ins & outs are not allowed. Q: Will set times get posted in advance? A: Yes. During the days leading up to the festival, set times will be posted via this site, our social media sites, the Insomniac app, and email updates. Set times will also appear on the festival guide you receive upon entry. Note: The lineup is subject to change. Q: Can I see a festival map ahead of time? A: Yes. Maps showing stage locations, food, bathrooms, etc. will be available prior to the event on this site and the Insomniac app. A: Professional photographers must obtain a photo pass using our press submission form. Do not email your request. Photo passes are not required for standard cameras with lenses under 15 cm long or handheld video devices under 6″. Professional video cameras are not permitted. A: See above for the complete list of acceptable and prohibited items. A: Yes. The Lost & Found kiosks operate during and between festival hours. The location will be marked on your festival map. Following the event, lost items will be held at the Insomniac Office in Los Angeles. Contact us if you need to retrieve your item after the festival is over. Please allow 72 hours for a response. Q: Does the venue have cash machines? 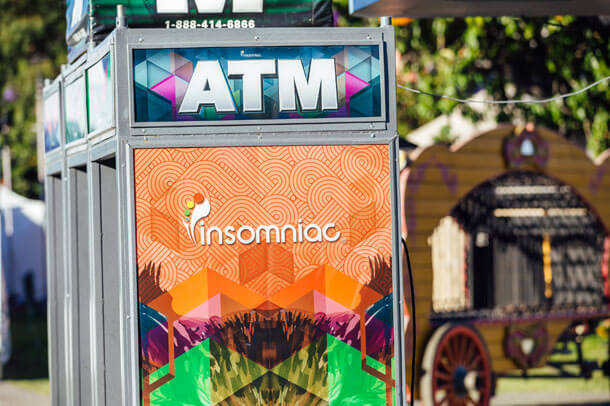 A: Yes, ATMs will be available both inside and outside the venue grounds. Locations will be clearly marked on the festival map. Q: Can I sleep in my car or park overnight? A: Sorry, sleeping in cars in the festival parking lot is not permitted for anyone. DO NOT leave your car in the parking lot during non-festival hours, or it will be towed at your expense. Q: Can I rent a locker? A: Yes! Store your stuff securely and keep your cell phone powered up all weekend long. 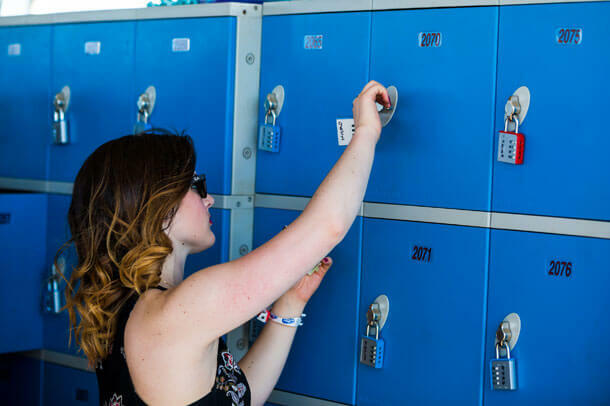 Learn more about lockers. A: No one under the age of 18 will be allowed into the venue, with or without a guardian. A: You must present identification to enter the festival and/or buy alcohol. See above for the complete list of acceptable and unacceptable ID. A: Security will accept expired ID cards ONLY if accompanied by official renewal documentation. If your ID was lost or stolen, you must bring a government-issued interim license or passport. Before contacting us, please see if your question is answered in the FAQ above. If it isn’t, find the appropriate contact below. Do not send inquiries to multiple email addresses. If your need is not addressed by one of the specific contract addresses below, you may send general questions to info@insomniac.com. For questions regarding ticketing, please contact Front Gate Tickets. Got questions about VIP packages? Contact vip@insomniac.com. 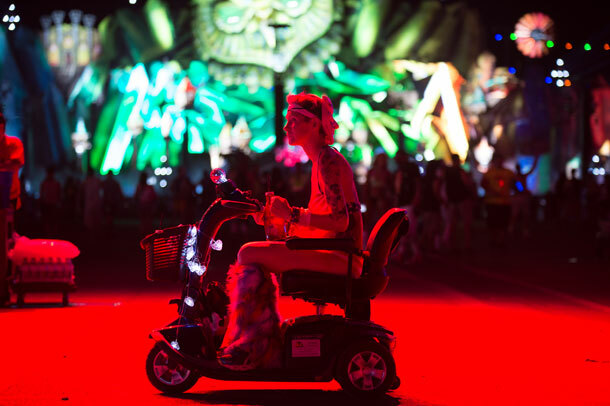 For questions or comments regarding access for people with disabilities, please contact access@insomniac.com. Companies interested in sponsoring Insomniac events should email sponsors@insomniac.com. To become an Insomniac performer, you must be at least 18 years old and have a performance background. Please submit portfolio and resume links to casting@insomniac.com. Proposals for large-scale art installations or interactive art concepts similar to the ones featured at our festivals should be submitted with examples of past work, concept description, and any designs/comps to art@insomniac.com. There is a strict NO FILMING policy at all Insomniac events. For photo and press media credential requests, you must complete our press submission form. For interview requests and other media inquiries, contact press@insomniac.com. If you are interested in being a food vendor at EDC New York 2016, please complete the application. 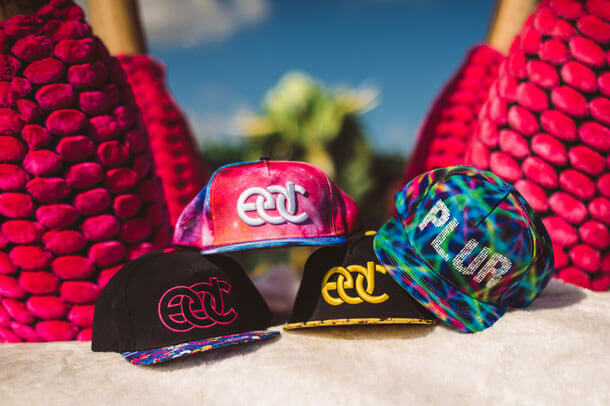 If you are interested in selling non-food goods or services at EDC New York 2016, please emailvendors@insomniac.com. If you encounter technical issues on this site, please contact webmaster@insomniac.com.